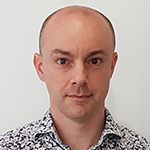 Dr Jez Weston has a physical sciences and engineering background with a PhD in Laser Welding from the University of Cambridge, as well as a BEng in Materials Engineering and a Graduate Diploma in Economics. He carried out research at the National Research Institute for Metals in Japan on solving satellite launch vehicle failures. He moved to New Zealand as a software developer in the private sector then worked with the Royal Society of New Zealand providing strategic and expert advice about the science system, research priorities, and science issues. A move into central government saw Jez working in science policy for the Ministry of Primary Industries. Since 2015, he has been with MBIE as a Senior Investment Manager in the Contestable Funding team. His primary focus is managing a portfolio of research investments from the contestable and commercialisation funds.